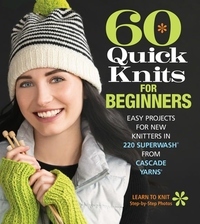 Offering a wide array of creative techniques and attractive patterns, this entry in the beloved 60 Quick Knits series is the perfect book for anyone learning to knit. Accessible, fun, illustrated with step-by-step instructions, and featuring insightful sidebars throughout, it demystifies complex skills and instills indispensable knitting wisdom. The projects themselves are everything new or experimenting knitters could ever want, from scarves, cowls, and mittens to shawls, socks, and baby clothes. And even though several garments have instructions specifically written for beginners, they're also chic enough for those with more experience.